This time of year, the last thing on your mind may be your heating system, but it’s the perfect time to upgrade one component or convert your entire system. If you’re one of the many homeowners who dream of getting off the grid but can’t quite take the plunge, here are some ways that you can tune up or step up your current system before the cold winter days arrive. If you have a home and/or windows and doors that are 20+ years old, start with an energy audit from the New York State Energy Smart Program (getenergysmart.org). A few hundred dollars will be well worth the information. New windows and doors can significantly reduce heat loss (up to 30 percent) and improve the quality of your indoor living (noise, temperature, damaging sun rays), but you may find that you just need to add insulation, replace failing insulation, or do comprehensive air sealing. If you choose to install a new heating system with the auditing contractor, the cost of the audit will be deducted from your final costs. When it comes to boilers, the old adage used to be “bigger is better,” but many are oversized and improperly piped, wasting energy and costing thousands of dollars over the lifetime of the system. Today’s boilers are compact, quiet, and highly efficient at 95 percent efficiency. Unlike conventional boilers, which run only at full capacity, new boilers start off on a low fire and then modulate depending upon the heating demands of your house. And, instead of emitting the combustion gases up the chimney at upwards of 500 degrees, a modulating boiler reuses these gases (as low as 90 degrees) as part of the heat source. Before choosing a boiler, have a heating contractor assess your home’s layout and, more importantly, perform a heat loss calculation factoring in the R values of your insulation, as well as the number (and quality) of exterior doors, windows and walls. Only then can he or she recommend the correct size boiler. The smallest condensing boiler (floor model) sold in the U.S. modulates up to 80,000 BTUs. While Advanced Comfort Systems installs Buderus and other brands, it recommends Munchkin and Prestige Solo, with an average cost of $7,000 installed, because of their high quality stainless steel heat exchanger. Tip: Make sure your contractor has been trained to install and maintain the specific boiler brand you choose and ask for a heat loss calculation. Be sure to schedule an annual maintenance check-up in late summer or early fall. Most boiler systems have the same parts (circulators, expansion tank, water make-up, etc. ), but if not piped in the correct order, the efficiency will suffer and so will your wallet. A properly piped system with lower voltage valves instead of circulators uses less energy and requires lower maintenance over the years. Setting up zones for different living areas can also increase your savings as well as your comfort level. Tip: You may not be able to tell if a system is properly piped, but by asking prospective contractors what systems they prefer—one zone or several, valves or circulators—you can get a better idea of the quality of their work. Ask to see pictures of installed systems (organized or haphazard?) and check references from other homeowners. Outdoor reset controls have become popular in recent years. These types of controls adjust the water temperature depending upon the outside temperature. The system then provides the appropriate amount of heat input necessary to match the heat loss of your home. Like cruise control for your home, outdoor reset controls enable the system to adjust to external factors. They also purge all of the heat that’s left in the boiler back into the system rather than leaving it unused in the boiler. The cost of adding outdoor reset controls is usually recouped within three years. Indoor feedback takes energy management to the next level. Indoor temperature readings are sent to the boiler to further adjust the actual temperature in the different zones. If your system runs on oil, consider converting to a more efficient and environmentally friendly heat source that will also be more affordable, such as natural gas or propane. Hidden costs: New gas tank and cost of burying it (optional). 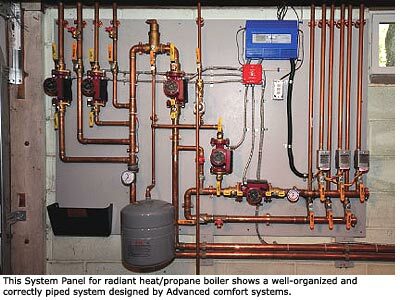 With a new boiler sized specifically for your needs and a more efficient heat source, an under-the-floor radiant hot water system is an excellent method for distributing heat throughout your home. Compared to forced air or baseboard hot water heat, radiant floor heating is more efficient and comfortable. It requires a much lower water temperature than baseboard heating, resulting in savings. The heat which radiates off objects such as furniture is also more comfortable and more consistent than forced air or baseboard heat. Whether you’d like to replace your old boiler, convert your whole heating system, or install one in a new home, now is a great time to take advantage of the recently introduced federal tax credits for 2009 and state and local rebates.